Looking for a job promotion? How about a new job with better benefits? Fill out the job search form below. Enter your desired job position and employment location. Then click on Find Jobs. If a raise is what you are seeking, then you must arm yourself with some logical basis as for why you are deserving of a raise. Now only must you explain why but why do you want the raise now. When you haven’t had a raise and it’s been at least one year. Time spent in a company is usually a good starting point for pay raise. In non-merit focused companies such as government entities, seniority and passing tests, plays a larger role in salary increases. When you have been given extra duties, responsibilities, tasks or other kind of work for a period of six month or longer and have not had a raise. You might also consider this situation if your duties have changed in some manner. For example, if you were hired to perform a written set of tasks and those tasks have changed, then it might be time for a raise. When others are getting raises and you have been overlooked. This is a tricky situation to bring up as point because most workers keep their salaries a secret. When the cost of living goes up in your area. Inflation based raises are commonly given every year and usually coincide with the Bureau of Labor statistics. Inflation pay raises are typically 2-4%. The right time to ask for a raise should revolve around your own situation and not the company. Even if the company has had a bad year or the economy is bad, you should still request a pay raise. If you wait till the company has a great year to request an increase in salary, you limit your earnings potential. Be ready to explain yourself and why you feel that it is time for you to be evaluated. After you have decided to ask for what you well deserve, it is important that your body language match your request. Don’t be verbose. Stay on topic. Stand up straight. Look your boss in the eye. Politely make your request! 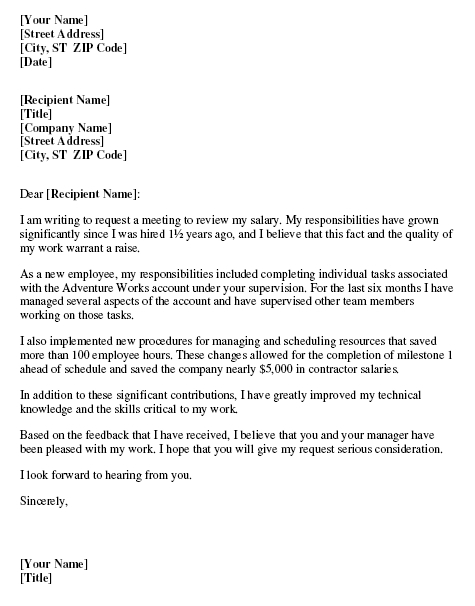 Here is a raise request letter for you to structure your own personalized raise letter. Make sure to evaluate your own worth and list some of the responsibilities in your position. Use numbers such as ways you have saved the company money or raised more money for the company. Be direct and stay targeted on your request. Most importantly, be professional even if your manager has a friendly relationship with you.